My first "official" teaching experience was in a small room in a barrio outside the capital city of Mozambique, Africa. The story is sadly familiar – not enough desks and chairs for all the eager students, no books, no pencils or paper. The official language was Portuguese, which I was learning for the first time, as were my students. Our tools were our voices, gestures, sticks in the sand, memories and stories. That was 1996-1997, a year after I graduated from high school. Afterward, I travelled in Europe then started a BA at UVIC in English and Anthropology. English because I loved stories, Anthropology because I thought it would connect me to people and cultures. I read some good books and met some interesting people. I tree-planted throughout the summers during this time. I loved the travel and the hard work and the people I met. In 2005 I became a mom to a wonderful boy. I finished my education degree in 2009 and work in SD68 as a French Immersion teacher. Last year I taught Grade 3 French Immersion where I started to experiment with technology as a teaching and learning tool. My students were diverse – as they always are – and I found that I could address the needs of a variety of students using technology. I enjoyed blending F2F instruction with online instruction and activities. Using technology I was able to inspire and challenge my students and find new and meaningful ways to teach concepts. I created a class website which I used to archive links and apps as well as a place to showcase student work. Importantly, I learned that learning does not occur in the presence of tools: it occurs through the effective use of the tools. Tech tools are everywhere and easily accessible. My challenge as an eLearning teacher is to guide meaningful selection and effective use of the tools. I’d like to be a driver of this transformation train and feel that online learning can play an important role. 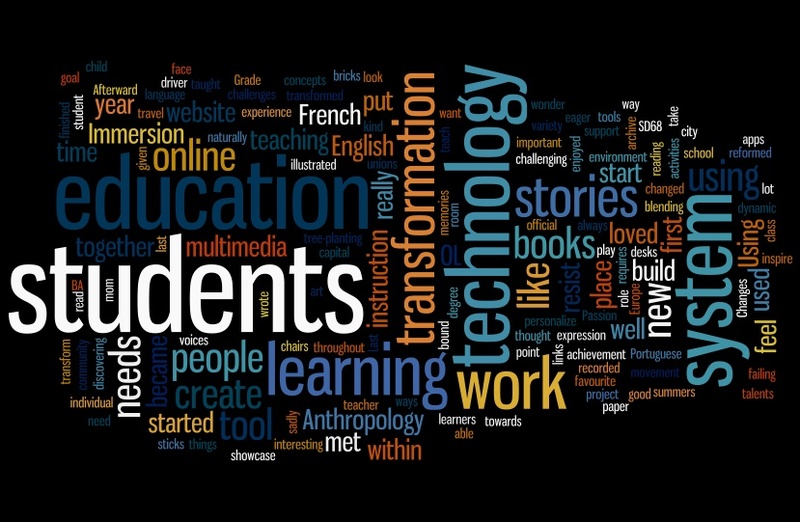 I would like to resist using technology as a mask that covers up an education system that is failing students. How do we use technology and online learning to really transform the system, not simply as a bandaid? How can we create a community of educators and work together towards this goal within a system that traditionally resists change and movement? What does the transformation look like and how can I start today? Using OL as a tool, can we step out of a dysfunctional paper-strangled system to create a new one or do we work within the system, take down the bricks then start to build again with new material?